Affiliation: All players and all persons who may be designated as responsible for a team, including coaches and anyone substituting for them, must be currently affiliated with Mass. Youth Soccer. This complete affiliation must be done before a team may play in BAYS. By no later than the Monday before the season begins, the BAYS secretary will determine from Mass. 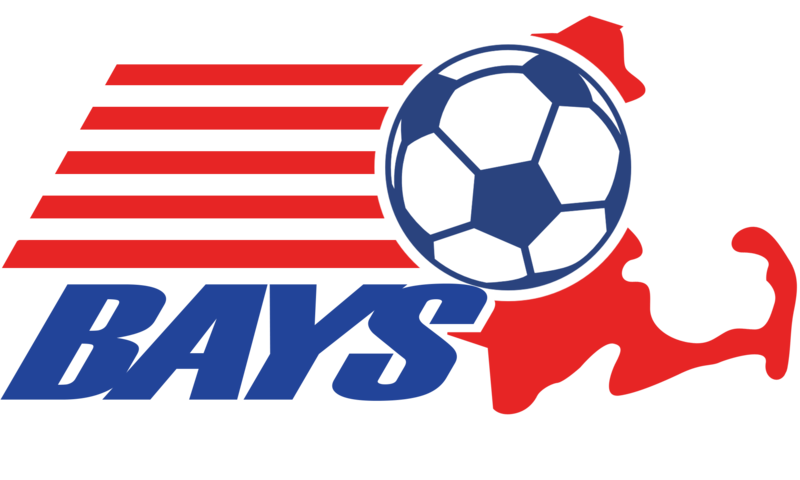 Youth Soccer which, if any, BAYS clubs are not affiliated with Mass. Youth Soccer and will immediately so notify the club(s) that have not affiliated. That notification will be by email or phone and will include an explicit warning that no team of that club may play until the club is affiliated, and all scheduled games of that club will be deemed forfeited until the club is affiliated. BAYS will impose on the club a $25 fine for each game so forfeited. Sponsoring organizations must have copies of forms for all of their players with signatures confirming liability waiver and permission for medical treatment. Coaches should have copies of these forms for their players with them at games. Boys’ and Girls’ Divisions: There will be separate boys’ and girls’ divisions. A team that has both boys and girls on its roster shall play in the boys’ division. Refer to the BAYS Policy on Gender Identity for teams with transgendered players. Roster forms: Whenever a BAYS roster/game form is required, it must be complete with required signatures and all other required information or the roster will not be considered valid for league play. A different (computerized) form may be substituted so long as all of the required information, game and referee reporting blanks, statements with signatures, and so forth are provided in a format similar to the BAYS roster/game form. Note: Coach’s signature and uniform numbers are not required on the form until game time. All player information must be typed. Handwritten insertions are not permitted. Exception: uniform numbers may be added or corrected by hand. A complete and accurate BAYS roster form, signed by a club official, must be in the possession of the BAYS division director before the first game. By no later than the Monday before the season begins, the division director will review all rosters in his/her possession, and will identify any team for which he/she does not have a roster, or whose roster is incomplete or defective or has an overage or otherwise ineligible player, and will immediately so notify the coach of any such team of the absence of a roster or any other roster problem. The notification will be by email or phone and will include an explicit warning that the team may not play until the division director has a complete and accurate roster for that team, and that all scheduled games of that team will be deemed forfeited until the proper roster is in the director’s possession. BAYS will impose on the club a $25 fine for each game so forfeited. A player may not play in a game unless he/she is on the roster. A team which plays with a player who is not on the roster in the possession of the division director will be subject to forfeiting all such games played and BAYS will impose a fine of $25 on the club for each such forfeit. Dual rostering: No youth may play on more than one BAYS team at any one time during the season. If a player is detected playing on a second BAYS team, the matter shall be referred to the BAYS Sportsmanship Review Committee. BAYS teams are also subject to any current Mass. Youth Soccer restrictions on playing in more than one league at any one time. Sizes: Non- MTOC eligible teams are limited to 22 players, except for small sided teams – (see appropriate section). Waiver applications to permit rostering more than 22 players should be submitted to the third vice-president for determination by the competition committee. Submissions: All non-MTOC teams must prepare a BAYS roster/game form and submit the form by mail or email to the appropriate BAYS division director no later than the Monday prior to the start of the season. Changes: Non-MTOC team roster changes may be made at any time, although the local club may place any restrictions it deems appropriate, such as drops. No added player may play until the division director has an updated roster. MTOC Teams: The following additional requirements apply to both fall and spring season teams playing in MTOC-eligible divisions (“MTOC Teams”). Eligibility: The age group and divisions within an age group that are eligible for MTOC will be determined annually by the Mass. Youth Soccer Leagues Committee. This information will be included in the Spring BAYS registration materials. Teams playing in Grade 8 MTOC eligible divisions are limited to 22 players (see bylaw 21 for Grade 6 9v9). Waivers to this requirement for Grade 6 and Grade 8 teams should be submitted prior to March 1st before the spring season in question or August 15th before the fall season in question. If a waiver is granted in spring season, the team will be ineligible for MTOC play, but must still meet all other registration requirements for MTOC teams. The Competition Committee by a 2/3rds vote may consider a request submitted after the deadline. If the club does have other teams in non-MTOC eligible divisions of the same age group where players could be accommodated, the waiver request must state why the oversize roster is a preferred option. Granting a waiver for the fall season does not imply the waiver will continue to the spring season. It must be applied for each season desired. Teams playing in MTOC eligible divisions in Grade 10 and older are limited to 22 players. Waivers to this requirement may be considered as long as the submittal is done prior to the first game date. If a waiver is granted, the team will be ineligible for MTOC play, but must still meet all other registration requirements for MTOC teams. Submissions: All MTOC teams must prepare a BAYS roster/game form, which must be submitted to the BAYS registrar or an assistant BAYS registrar for review and stamping. After stamping, the roster shall be submitted by mail or email to the appropriate BAYS division director no later than the Monday prior to the start of the season. Rosters for MTOC teams must be stamped by a league registrar before being so submitted or being used in a game. That team is ineligible for the BAYS post-season playoffs and MTOC. Any players who received a waiver under Section 5.A may remain on the team. The team will be subject to the roster size rules applicable to non-MTOC-eligible teams under the by-law 6.B (including players having a waiver granted by the competition committee for additional players) but will not be subject to the team roster size rules for MTOC eligible teams in by-law 6.C. The team will not be subject to the player pass-card requirements applicable to MTOC-eligible teams under Bylaw 6.C. A Roster will need to be submitted to the BAYS Registrar for validation prior to the first game played in the new section. The validated roster shall indicate that the player pass-cards are not required. The team will remain eligible for any other BAYS Competition they have entered (e.g. President's Cup) and not be subject to any new restrictions due to the move. All games against all teams in the new section will count in the standings unless the timing of the move does not permit an equal number of games to be played against all opponents in the new section in which case the Competition Committee will determine (in advance of the move) which games will count in the standings. Coach CORI and Passcards: For both Spring and Fall seasons, any person who will be responsible for the team at a game, including the coach, or other person acting as a substitute in charge of the team, must have a BAYS or a US Youth Soccer coach’s member pass card with a current photograph and a validation sticker for the current year. The person also needs to be on the CORI cleared list, maintained by Mass Youth Soccer, prior to their name being allowed on a Team Roster, or allowed to coach a team.. Player passcards: For the Spring season, BAYS or a US Youth Soccer player member pass cards are required for each player on the following teams: all Grade 12 and older, all first and second division Grade 10, Grade 8 & Grade 6 . Passcards must have a current photograph. Passcards shall be issued and validated by the town registrar or other authorized town official in accordance with procedures published by the BAYS registrar. Players’ rights with respect to roster changes. Once a player has been listed on a roster filed with a BAYS division director, the player is entitled to remain on that roster for the remainder of the current playing season. Clubs may make involuntary transfers or drops only in cases involving poor attendance, disciplinary problems, or safety issues. Players may appeal such actions to the BAYS protest board, which shall review whether the club had a reasonable basis for its decision.